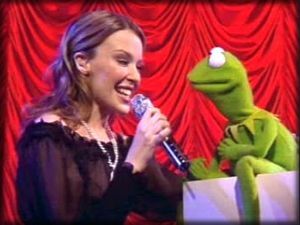 Pint-sized pop star Kylie Minogue has duetted with Muppets legend Kermit The Frog for a TV special to be shown in October. The unlikely duo perform Kylie's 1988 hit "Especially For You" as a highlight of her upcoming show An Audience With Kylie Minogue. Kylie's new singing partner is a dramatic departure from her original co-star, Jason Donovan, who also appeared with the "Moulin Rouge" actress in Australian soap opera "Neighbours" in the 1980s. The two tiny singing stars will be broadcast on British channel ITV on October 6. Kylie will be singing many of her hits on the night, including "I Should Be Lucky," "Better The Devil You Know," and "Step Back In Time." The celebrities who turned out to join the star-studded audience for the singing spectacle featured Boy George and Anne Charleston, who played Kylie's screen mother Madge in Neighbours. Banjo-playing Kermit has been in the showbiz industry for more than 40 years, and is furthering his British TV appearances with a guest slot on British Broadcasting Corporation's BBC2's "Nevermind The Buzzcocks" on October 1.